It’s happened to all of us, you’re driving down the street and notice something isn’t quite right with your car. It’s making new and unsettling noises. You take your car to a mechanic and he tells you that your transmission is shot. What does this mean? By this point, you need to rebuild or even replace your transmission. But what caused your transmission to fail and how could you have prevented it? When your transmission is grinding, vibrating or just making funny noises, this means that something is wrong. The best policy is to service your transmission at regular intervals. It’s important to bring your car in so that you can spot early signs of transmission failure and have it looked at by an expert. Don’t wait until it’s too late. Here are considerations you need to be aware of when you think you’re having having transmission troubles. If you have any questions regarding powertrain transmission repairs, call General Transmission Reno and talk to an expert today! The transmission is the glue that holds your vehicle together. To prevent it from encountering any future problems there are necessary steps that need to be taken. First, you’ll want to target the source of the problem. If your car is leaking, making unusual noises, or not fluidly changing gears, it could be signs of potential transmission troubles. Next, check your transmission fluid levels. One of the most common problems when it comes to transmissions is the level of fluid. It’s important to check the levels frequently and empty or fill as needed. Then, if all else fails, take your car to the shop. An expert can help you target the problem with your transmission and repair it before it becomes a bigger issue. What goes into a full blown powertrain transmission service? Just like other components in your car, your transmission requires servicing at regular intervals (between every 100,000 -150,000 miles). When it comes to powertrain transmission services, the most common is transmission fluid replacement. The transmission is the integral cog that keeps your vehicle going and you want to do your best to take care of it, not only save yourself some extra cash, but to prevent any future failures. If your transmission fluid is sitting at low levels or has gone from its normal shade to a dark black color, it is time to get your fluid replaced. It is recommended that you check your transmission fluid levels every month. Once you hit the 2-4 year mark, you’ll want to bring your car in for a check-up. A transmission fluid replacement begins with draining the current fluids into a pan. Once this has been done, they check for any repairs that need to be taken care of (filters, pans, etc.). After a thorough inspection, the pan is re-installed and the transmission fluid can be refilled. Depending on the type of car you drive, a transmission fluid replacement can cost anywhere from $60 to $250. Determine if your powertrain warranty has expired on your vehicle. Short-term powertrain warranty: usually 5 years or 60,000 miles. Long-term, which is 10 years and around 100,000 miles. If your warranty has not expired, then you can have the dealer or manufacturer cover the work, typically at no cost to your self. Powertrain warranties tend to last much longer compared to other warranties offered, you can get more information from your local repair experts on the benefits of powertrain warranties.If your warranty has expired, you can opt to purchase a new warranty that includes powertrain repairs. And if purchasing a new warranty is not of interest, then you can bring your car by your repair shop and have it looked at by an expert. What are the early signs of transmission failure? As a driver, your worst fear is driving down the street and noticing that there is a nasty, burning odor coming from your car. Just when you think it can’t get worse, you begin to notice that you’ve been having trouble shifting gears and that your car is making unsettling grinding noises.If you’re car is experiencing these symptoms, it may be time to bring it into the shop for transmission repairs. Trouble shifting gears: if you are struggling to shift gears, it may be a sign that your transmission is in need of repair. The cause of this could be anywhere from worn down gears to low levels of transmission fluid. Unsettling noises: if you begin to hear clicking or higher pitched whining noises coming from your car, it could mean that your fluid levels are low and either need to be refilled or changed. If your fluid levels are normal, the noises could be a result of a defective torque converter. Burning odors: If your car is emitting a burnt smell odor, it could be a sign that your transmission is overheating and the transmission fluids need to be changed. 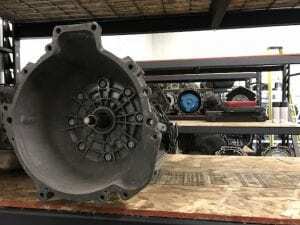 How do I know if I need a full blown powertrain transmission rebuild or replacement? If you begin to hear new or unusual noises while driving, it could be a sign that your transmission needs to be repaired. These noises should not be ignored and if they are caught early, you can save yourself and your transmission from a costly repair.